Model of cariole made from wood and Native smoke-tanned hide. 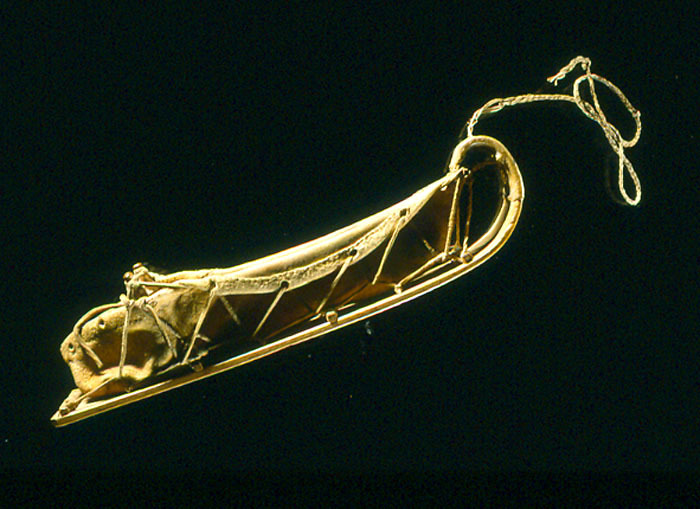 The sled portion was made from wood and the back and the sides were fashioned from hide. The term “cariole” was first used to refer to a variety of horse-drawn sleighs, particularly the lightweight open sleigh used in French Canada. Sometimes these sleighs were pulled by dogs. During the fur trade era, the term “cariole” became more commonly used for a toboggan-like sled with sides made from hide or canvas. Birch boards were often used for the sled portion. Pulled by a dog team, the cariole transported a passenger or cargo. A dog team driver would run along behind the cariole sled while it was under way, shouting commands to the dogs to guide their pace and direction of movement. Trappers and traders used the cariole throughout the winter months to transport supplies and furs.